I first tried smoking when I was about 12. Shocking I hear you cry. Let me just point out that this was back in 1964 and not in these notoriously wild times. I was caught with a packet of ten Park Drive tipped, in my school satchel, and was so terrified of the consequences at home, that I stopped immediately. However, I guess I was destined to be one of those children who must try what they should not. By the age of 16 I was smoking again, but a little heavier. My Mum and my older brother did not smoke, but my Dad did. When I was 17 my Day died suddenly, at the age of 55, after suffering cancer for a short time. He probably had the illness for a while, but he only lived a few weeks after it was diagnosed. For a few weeks I stopped smoking but then started again. I was still at school and would save up my lunch and pocket money to buy a few fags (cigarettes). I left school not long after that time, at the age of 18, and smoked heavily until I was 36. During this time I tried to stop smoking twice. On the first occasion I lasted three months and the second time seven months. Both times I started smoking again, as I had put on more weight than I wanted to. Eventually, I realized that it does not matter how gorgeous the outside of your body looks, if the inside is full of cancer inducing agents and nicotine filled smoke. Not that I ever was gorgeous but you know what I mean. After a couple of periods of ill health, during which time I seriously thought I had cancer, I was diagnosed with an overactive thyroid gland. Smoking would inevitably make this condition worse. My smoking ceased just before the diagnosis came through. I lit a cigarette one day coughed a lot, felt quite sick and thought "what the hell am I doing",Twenty one years later I have never had a single drag of a cigarette. I will have as a passive smoker, though, but have tried to avoid even that. That does not mean that occasionally I have not wanted to smoke. My hubby still smokes and most of the time the smoke smells awful. Thankfully, he usually indulges his nicotine habit, begrudgingly, outdoors these days. The outdoors is one of the few places that a cigarette still smells nice to me and could almost tempt me to have a drag. The sort of outdoors I mean is, sat on a beach in Summer or on the edge of a river front. I will never have a smoke though, not even a little drag. The reason is that, it was so hard at times beating the pull of cigarettes, that I would not want to have to try again. Each time I stopped I was instantly hooked again and would smoke more than ever. I guess I have a compulsive personality and could never stop at the occasional cigarette. I wish I could. In some ways I miss smoking. One thing is for sure though, times have changed. My hubby finds these days that he and his fellow smokers are ostracized at parties and functions, destined to a corner somewhere with just each other. Since the ban on cigarette smoking in public places, in England in 2007, smokers do not have an easy time. Years ago I worked at places which were full of smoke all day, as we workers who were smokers merrily puffed away on our cigarettes, choking the poor non-smokers. I remember cinemas so full of smoke that even we hardened smokers could not see, as our eyes watered so much. These days smoking is not allowed in such places or on public transport and so getting a quick fix of nicotine can be difficult. 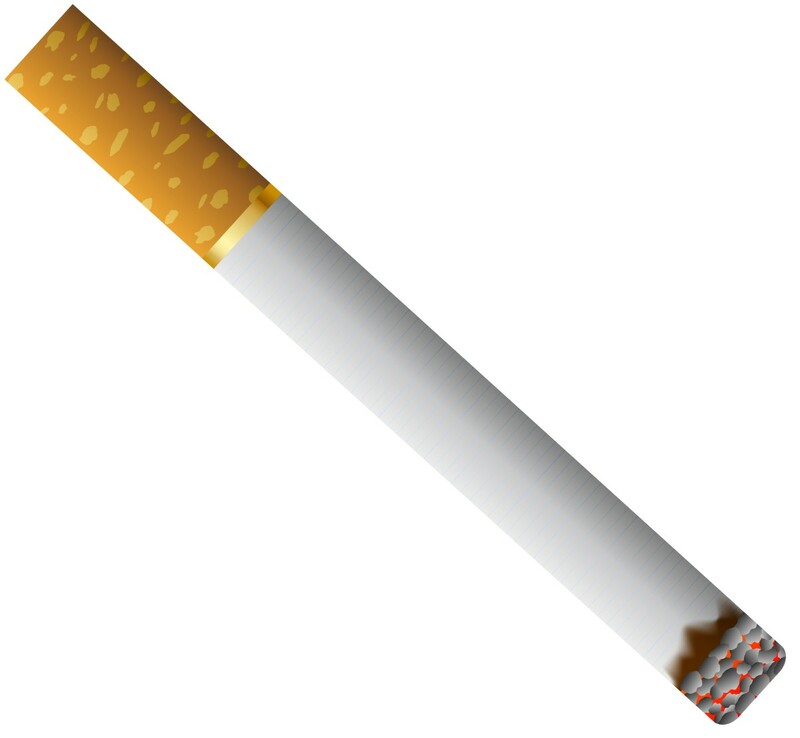 When I stopped smoking I simply decided that day, threw my cigarettes away and went Cold Turkey. Below is what I did, and hopefully includes some hints and advice, which may help you become a non smoker. Firstly let me say that there are no miracle cures that will stop you smoking. There are many support structures, treatments and products that may help you to stop but it will be up to you. Whatever course you decide to try to follow, in your quest to become smoke free, will need some WILL-POWER. Secondly let me say that you cannot make someone else stop smoking, no matter how much you love them or want them to. The smoker will need to want to stop smoking, for whatever reason. So that you do not smell of smoke. To make you more attractive. 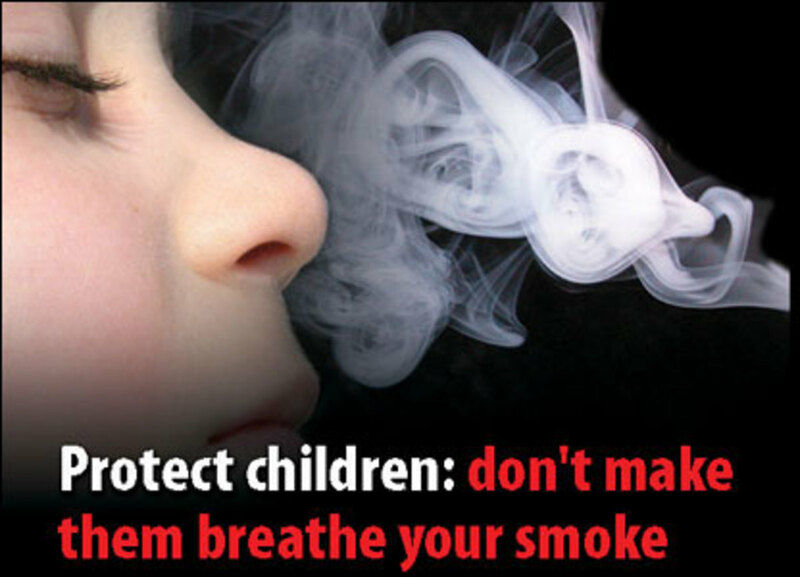 To support a loved one, who is stopping smoking. To stop your teeth looking yellow or even brown. Obviously it does help if everyone in your household stops smoking but you cannot make them. You may be someone who will plan your "stopping smoking" day well. Some smoker's like to plan ahead, select a particular day and be very organized. Others will just say "right that's it I'm not smoking anymore". There are no rules, though, and it is to you. You should know yourself, better than any other person does, and know what will work for you. 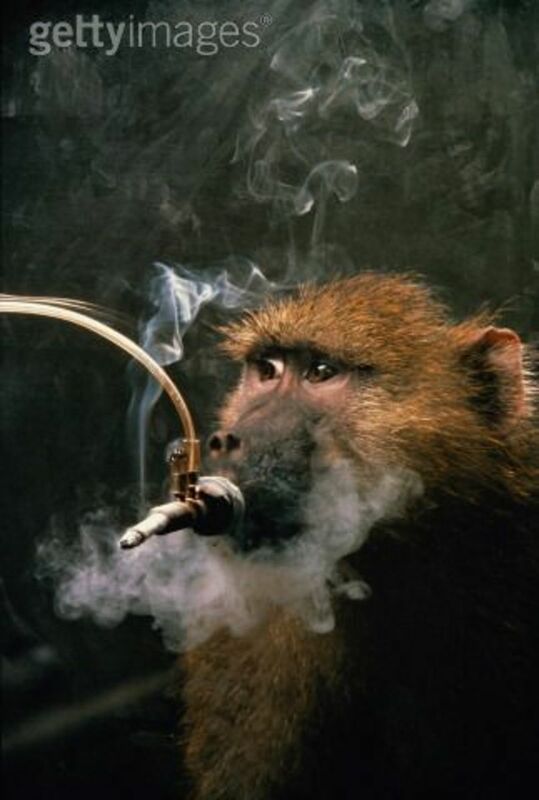 Here is what I did when I stopped smoking, many years ago. I was not working at the time, which in some ways made it easier. However, it did mean that I could have a cigarette when ever I wanted to. I decided that I would keep busy. If I sat for too long or got bored the temptation to smoke would niggle away at me. Baked almost everyday. Money was tight when I was at home and so I made pies, homemade jam, home brewed beer, pastries and more. All of these meant that I was smoke free. Well, at least, while I was busy baking and the like. I did gardening. We had only recently moved into our home. The garden was fairly large and rambling. Never one to be afraid of a little hard work, I dug this garden, back and front, in fits and starts. If I sat for a while and started to crave a cigarette I would head out into the garden. I had stopped smoking on the 1st April and so I had all of the summer to get to grips with my withdrawal. I planted potatoes, strawberries and tomato plants. I exercised my dogs more than ever. They loved it. If I had no cigarettes or money with me there was no way I could indulge in a fag when I was outdoors. I decorated the home. Admittedly in the past I had smoked occasionally whilst decorating but not this time. Painting and wallpapering need both hands anyway. There were also lots of other ways that I avoided the smoking urge. I did not use any replacement therapy, hypnosis or other products but if these will work for you go for it. I just used sheer determination. I decided that if I did not give up then I never would. Each year would just get harder. If you want to use nicotine replacement therapy get a supply ready. Have a hypnosis session if that will be within your means. Try Allen Carr's tapes or book. Assess your smoking habits. For example, some people always light up first thing in a morning or after a meal. Get to know your vulnerable times and decide how you will address this. Initially I would reach for the biscuit barrel straight after a meal, as I still felt hungry. Avoid such antics. Try instead to crunch healthy raw carrot sticks or eat an apple. Try to to go out for a walk after your meal. Alternatively try a jog, bicycle ride or a walk with your dog. Anything that gets you out of your routine and away from temptation. Keep a diary if it helps. Perhaps writing down your feelings about smoking may help to strengthen your resolve. Keep reminding yourself of why you want to stop smoking. 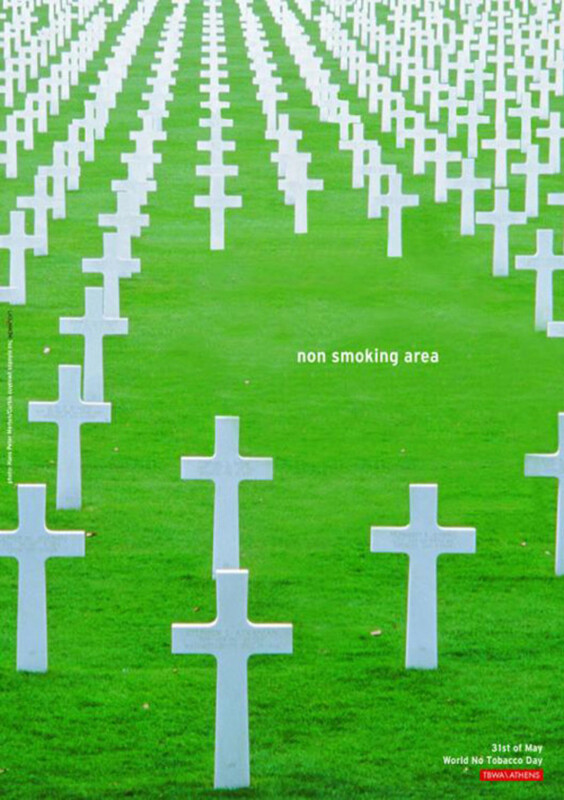 England has Stop Smoking Services provided by the NHS which may be appropriate for you. Try to save the money you would have spent on cigarettes and reward yourself every so often with a treat. A new CD or shoes. Something just for you. See if you can get people to sponsor you to stop smoking, with the money raised going to a favourite worthy cause of yours. This may make you more determined than ever. Take each day at a time. 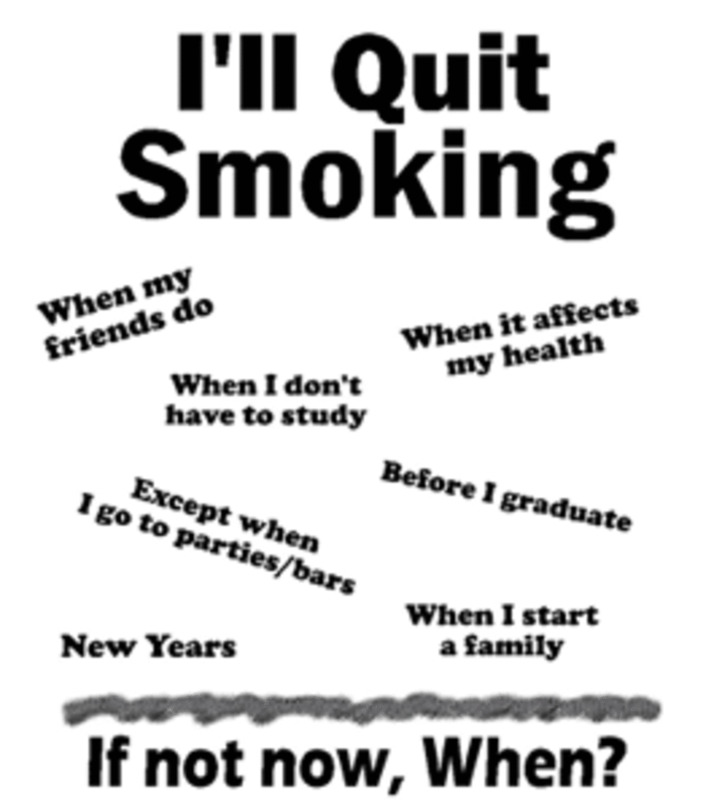 Do not think ahead to a month or years time or especially the prospect of never smoking again. Avoid places and people that will make it difficult for you not to smoke. 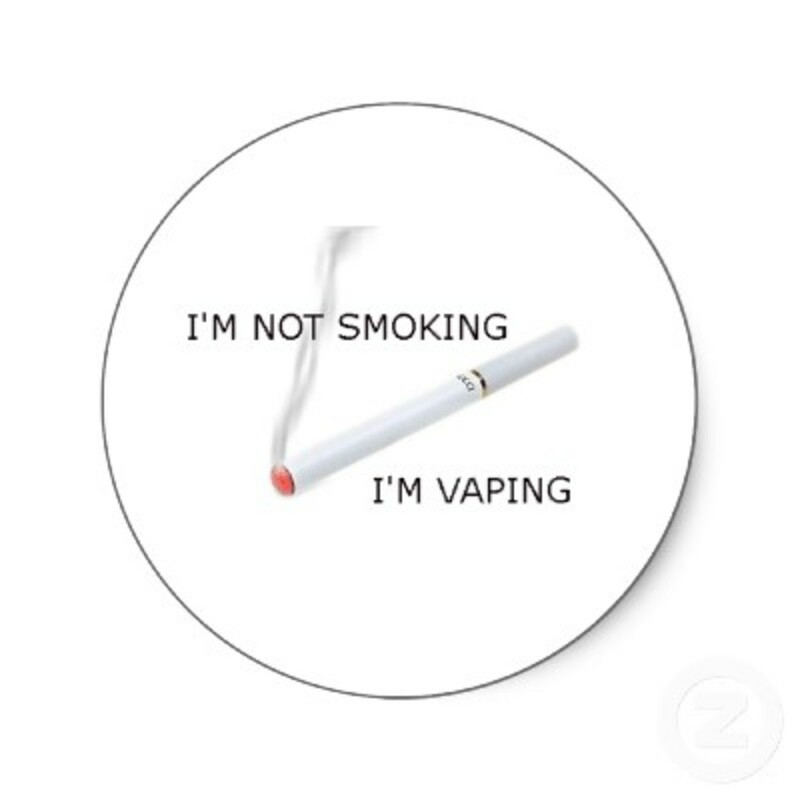 After a short while of being nicotine free you will notice that you smell much nicer, your skin and hair are in better condition and that you do not cough or get out of breath as much as you used to. Deep down we all know smoking is not good for us but we either choose to ignore the horrible statistics or simply assume it will never be us. NOW THAT YOU ARE A NON SMOKER. Please try and be a little tolerant to those who still indulge in cigarette smoking. There is nothing worse than a reformed smoker laying down the law. One thing that you will notice is no longer smoking sets you free. When you are an addicted smoker you always need to have cigarettes, tobacco or money. The thought of being deprived of your smoke can be really scary. Once that habit or addiction is broken this need will disappear and boy will your bank balance improve. When I was young I tried very hard to get my dad to stop smoking. I emptied the cigarettes out of the package, rolled up paper and put these back in the package, and threw all the cigarettes in the forest near our house. My dad threw a fit, and then went into the woods to scoop up every cigarette. My dad finally stopped smoking recently, but nothing I could do would make him until he wanted to. excellent informative article- thank you for writing it! I never smoked but both of my parents did until years later when they both successfully gave it up. My father went cold turkey and never relapsed. It took my mother a while longer to finally give it up for good. 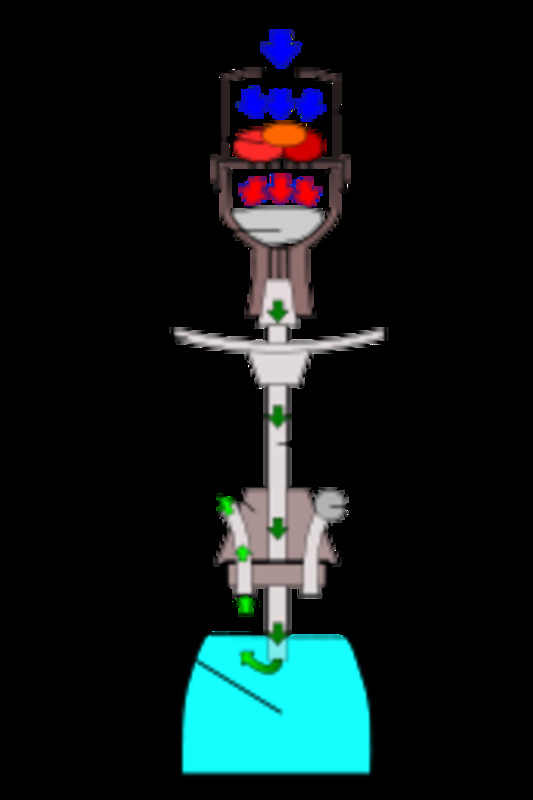 Most of the laws in the U.S. restrict smoking also and since even second hand smoke is bad for one's health, that is good. Congratulations on your success and for passing along these helpful hints for those trying to break the habit. Up, useful and will SHARE. I admit to wanting the magic wand, but I appreciate your input on it. Ionn, I didn't say it wasn't worth trying, just that it's not a magic wand! Thanks Amanda. A few of my Hubby's colleagues used hypnosis to stop smoking but as you say they had a strong desire to give up. Ethel, as a hynotherapist, I've worked with people who wish to quit smoking. Your hints and tips here are spot on. There is absolutely no point in expecting a hypnotist to wave a magic wand, and for it all to go away. The desire to quit has to be a strong one. Hypnosis is not a magic wand, although it can certainly make the difference between success and failure! What a great hub, ethel. Wow, very informative stuff. 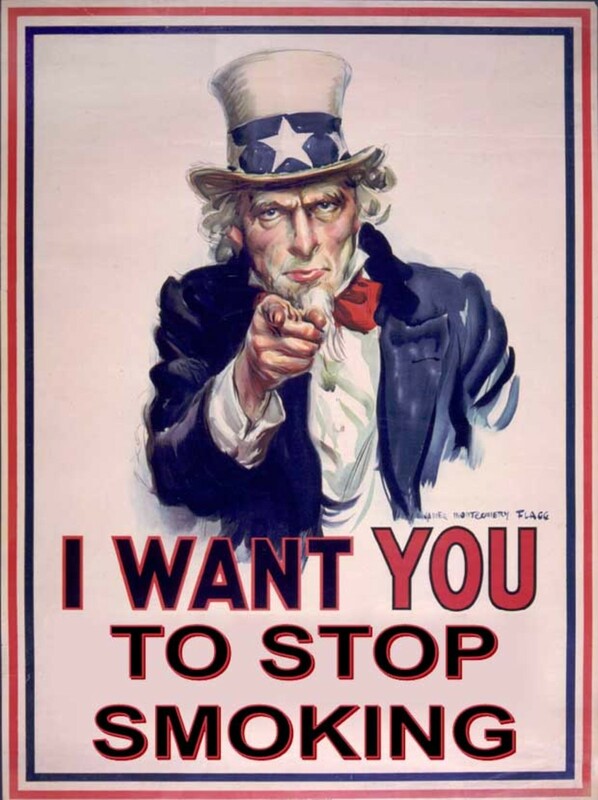 Stopping smoking is supposed to be harder than stopping any addiction. You have some great tips in here, not to mention presenting the true facts about how dangerous it is. Thanks for writing this, ethel. Thanks bgamall. I tend to think that if I, an addicted heavy smoker, could stop it is possible if you try hard. Its like when you diet and sone ddays it is just the right time for you. Thanks for stoppimg by. This is a very informative website. There are concrete steps you can use to walk away from smoking. People should take these to heart. Ah Dolores you sound like my Hubby :) Trust me it gets harder to stop the more years that you have smoked. You packed a lot of stuff in here, ethel, and good for you that you quit. Those lungs look pretty disgusting and dyng from smoking is the final drag. (haha) I'm one of those people who are going to stop. Yes I am. I&eth;unn The telephone sabotaged me? Wanderlust and ultimate hubber its surprising how the smoking habit can creep up on you. I know something has to kill us one day but smoking can be so devastating to your health and bank balance. I quit it this January. In facts 9th of Jan. Didn't smoke till late June. Now smoke very less, just one or two cigs a day. I always wonder why some people will start back after quitting for a few years. I've never managed to quit and it's what you said - you have to really want to. I suppose I don't, yet.